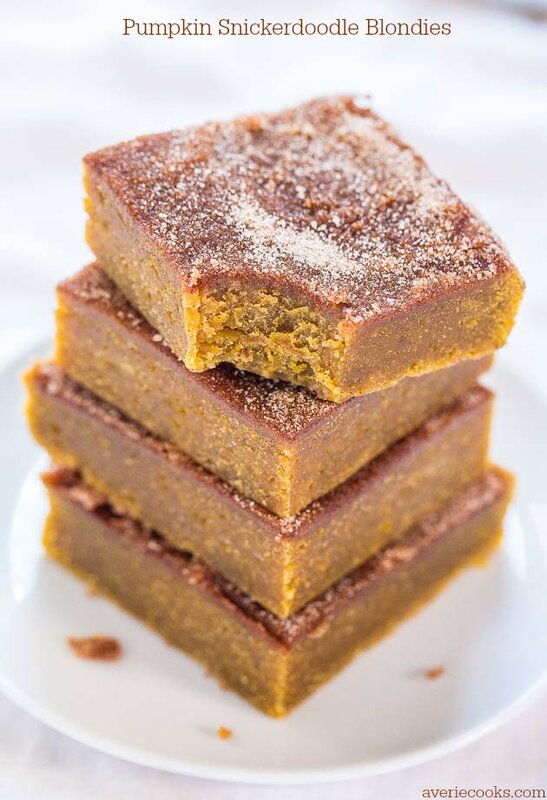 Bars are my favorite dessert to make because they’re so fast and easy. No dough to chill or individual cookies to form. 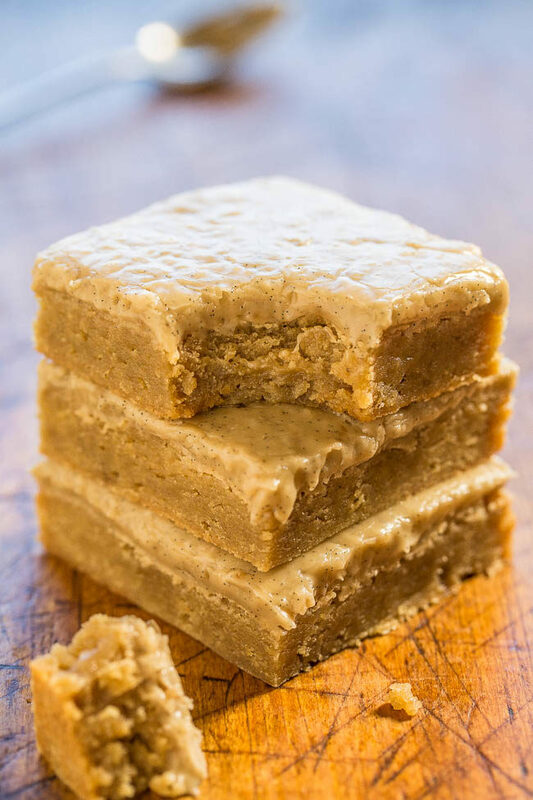 For these very soft, slightly chewy, buttery blondies that are topped with the most amazing vanilla bean-infused caramel glaze, I called upon my trusty blondie base. When I want an easy, fuss-free, one-bowl, no-mixer recipe that I know everyone will love, it’s my go-to . With 25+ versions and counting, it never lets me down. It’s an easy recipe to memorize because everything is ‘one’. In the 1 bowl used, melt 1 stick of butter, stir in 1 egg, 1 cup of brown sugar, 1 tablespoon vanilla, and 1 cup flour. The blondies are glazed with one of my favorite glazes of all time. It’s adapted from the Spiced Apple and Banana Bundt Cake I made back in 2012, and I’ve never forgotten that glaze. The glaze is caramely from the brown sugar, buttery, creamy, slightly salty that’s reminiscent of salted caramel, and flavored with vanilla bean paste. I recommend the paste because it’s more intensely flavored than vanilla extract, but extract will still work. The glaze is rich, decadent, and I want it on everything. It’s especially good on the blondies and really makes the dessert pop. 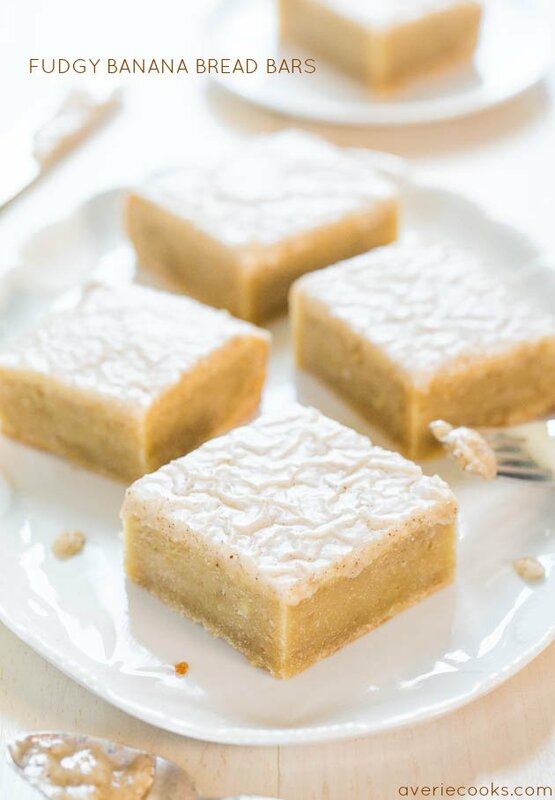 Bars are my favorite dessert to make because they’re so fast and easy. For these very soft, slightly chewy, buttery blondies that are topped with the most amazing vanilla-spiked caramel glaze, I called upon my trusty blondie base. It’s an easy, fuss-free, one-bowl, no-mixer recipe everyone loves. The glaze is caramely from the brown sugar, buttery, creamy, slightly salty and reminiscent of salted caramel, and flavored with vanilla bean paste. It’s rich, decadent, especially good on the blondies, and really makes the dessert pop. Use caution when making it because the mixture will bubble up as noted in the directions. 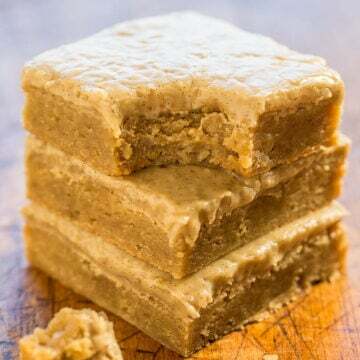 Blondies – Preheat oven to 350F. Line an 8-by-8-inch baking pan with aluminum foil, spray with cooking spray; set aside. Turn batter out into prepared pan, smoothing the top lightly with a spatula. Bake for about 20 minutes, or until top is set in center and done. A toothpick inserted in the center should come out clean, or with a few moist crumbs, but no batter. Blondies firm up as they cool. While blondies are cooling, make the glaze. Glaze – This is a fast moving recipe; have everything in place before you begin. To a medium saucepan, melt the butter over medium-high heat. To the melted butter, add the brown sugar and bring to a boil, whisking nearly continuously. Allow the mixture to boil quite rapidly for 1 minute, whisking nearly continuously. Remove pan from the heat, allow it to cool for about 1 minute, and add the cream, taking caution because the mixture will bubble up vigorously. Whisk aggressively to incorporate the cream and calm the bubbling. After the bubbling has subsided, add the vanilla bean paste and whisk to combine, using caution because the alcohol in it could cause the mixture to bubble up again. Add the confectioners’ sugar (I absolutely recommend using sifted sugar so the glaze whisks up smooth, silky, and free from lumps), optional salt, and whisk to combine. Glaze should be easily pourable but not too thin. If it’s too thin, add a touch more confectioners’ sugar and if it’s too thick, add a splash of cream and whisk until desired consistency is reached. Pour glaze over blondies and allow it to set up for about 30 minutes before slicing and serving. 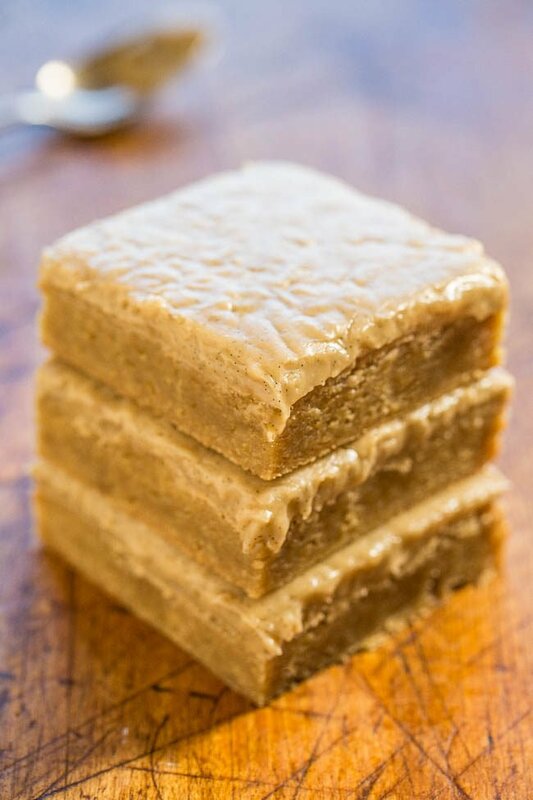 Blondies will keep airtight at room temperature for up to 1 week, or in the freezer for up to 6 months. Fudgy Banana Bars with Vanilla Bean Browned Butter Glaze – The banana equivalent of moist, fudgy brownies! Best use EVER of ripe bananas! 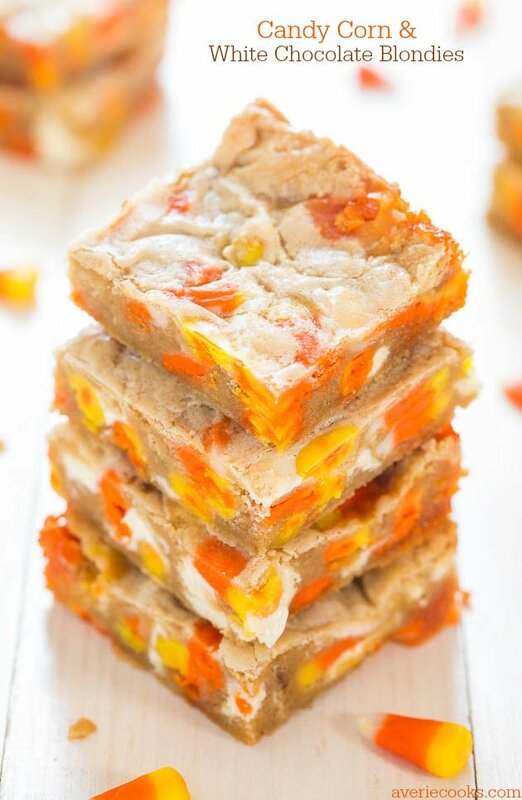 Candy Corn and White Chocolate Blondies – Wondering what to do with your candy corn? Bake it into soft, easy blondies! Best.Use.Ever. 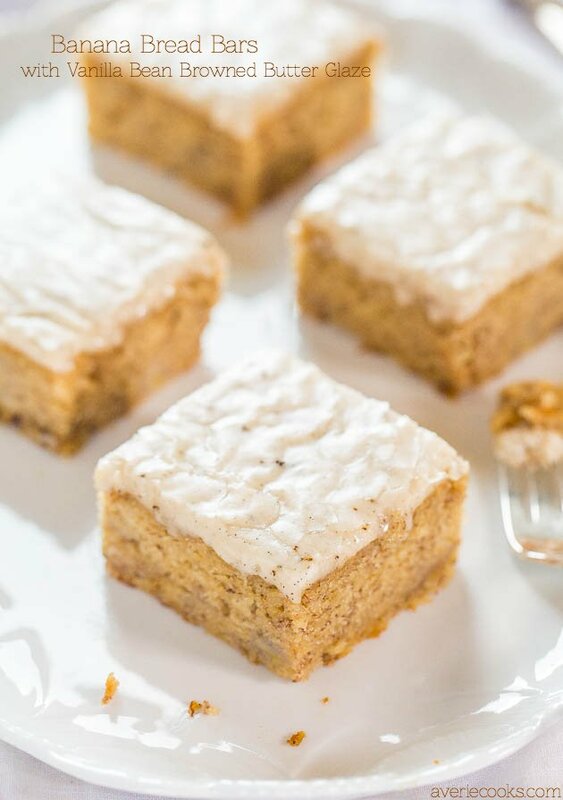 Banana Bread Bars with Vanilla Bean Browned Butter Glaze – Banana bread in bar form with a glaze that soaks in and is just so.darn.good! 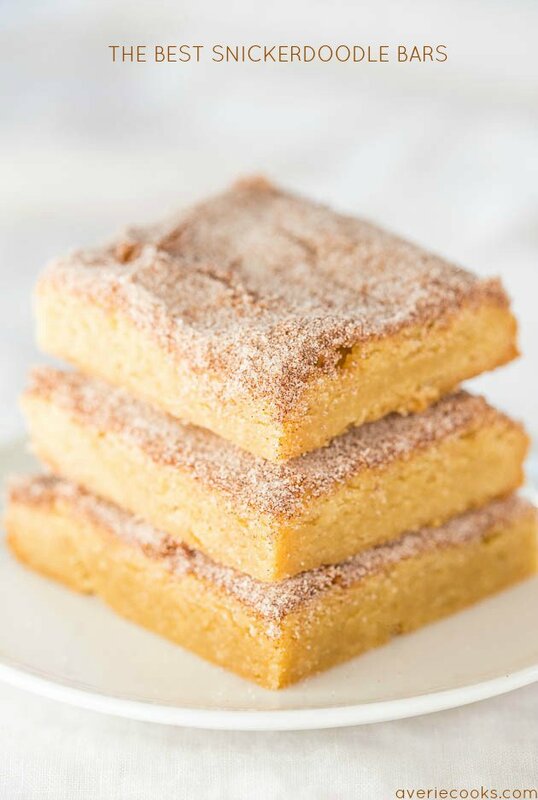 The Best Snickerdoodle Bars – They taste just like snickerdoodle cookies in fast and easy bar form! Soft, chewy, buttery…So irresistible! 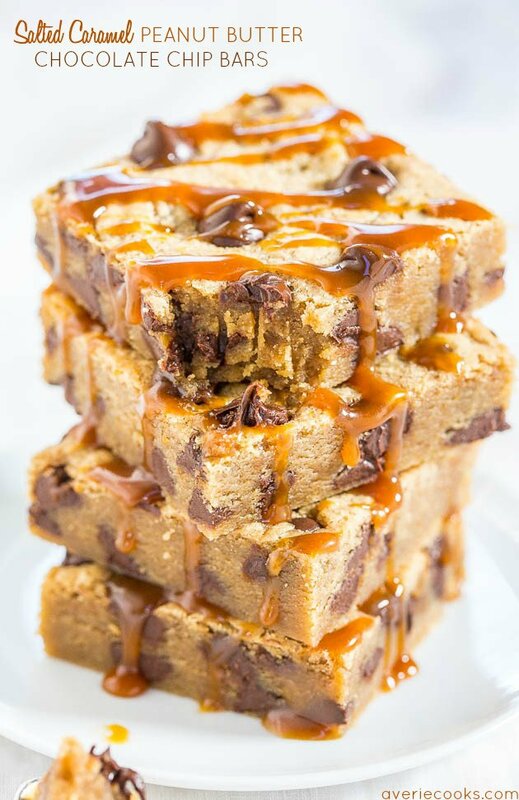 Salted Caramel Peanut Butter Chocolate Chip Bars – Made with salted caramel peanut butter! Soft, chewy, gooey and so irresistible! 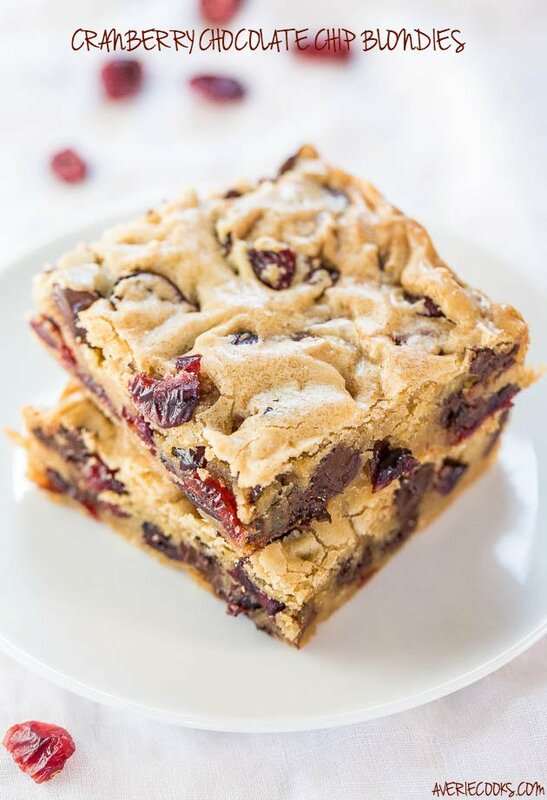 Cranberry Chocolate Chip Blondies – Super soft, buttery bars packed with chewy cranberries! And there’s a chocolate overload in every bite! 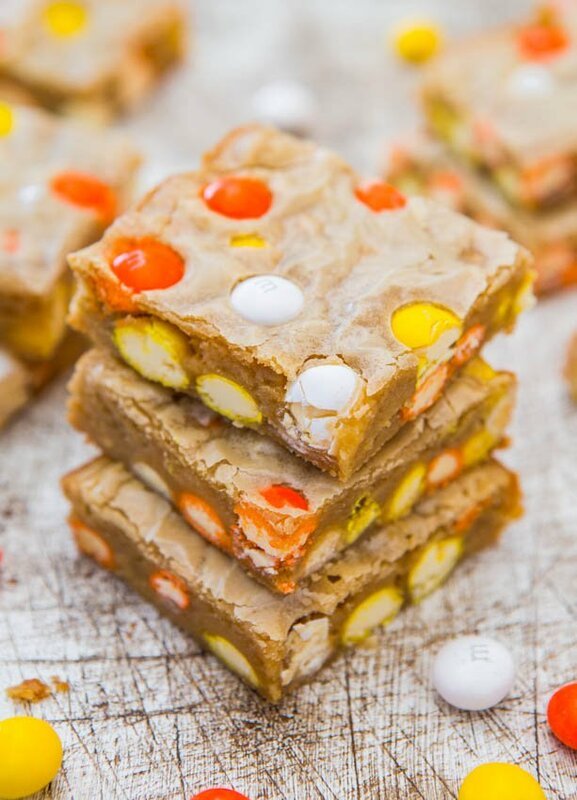 Candy Corn White Chocolate M&M Blondies – Fast, easy, one-bowl, and mix in your favorite seasonally-flavored M&Ms! 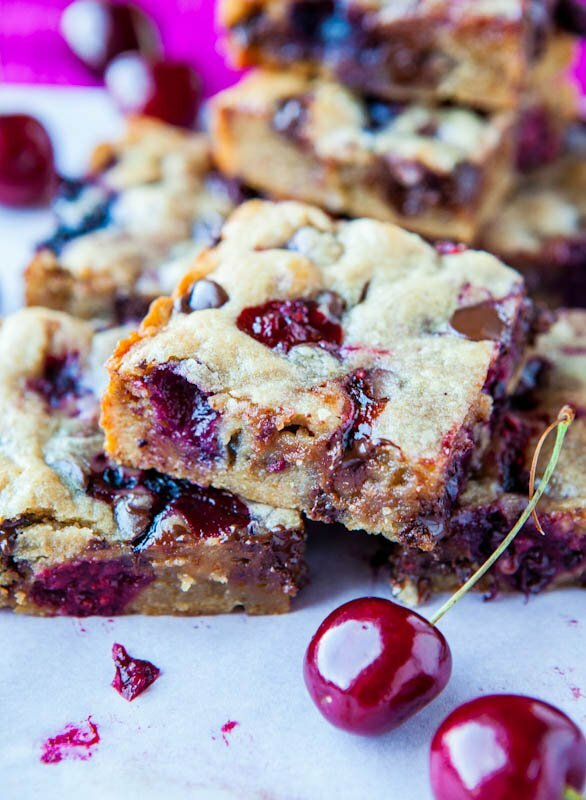 Chocolate Chip and Cherry Blondies – Soft buttery blondies packed with juicy cherries and chocolate chips! Having fruit for dessert takes on a whole new meaning! These. are. unbelievable! Made them, ate them, dreamt about them, and wanted to do it all over again! Truly a new favorite of mine!!! The only “issue” I had, was I had no cream, but used whole milk instead and as I added, it caused some of my caramel to clump up. I was able to finish the caramel sauce off with vanilla bean, as I had no vanilla paste, and just fished out the clumps and ate those like chewy toffee! Thank you for sharing!!! Your formula was the best! Was the blondie great, as well as the genuine coating was executioner. The vanilla bean inside was virtuoso! Finally made these today, worth the wait and dreaming about them! Thanks for the recipe! Thanks for trying the recipe and I’m glad it came out great for you! Glad they were worth the wait! These are easy to make and are SOOO good–my favorite combination! I used vanilla extract instead of paste, and the bars still turned out to be delicious. The caramel glaze is heavenly. My husband compared these bars to maple frosted donuts, and the comparison works somehow. But they mainly taste like deliciousness wrapped in caramel. Whenever I make dessert it usually involves some form of chocolate, but these are so good that I’ll forgive the lack of chocolate! The maple frosted donuts comparison is a great one, totally agree! How much salt is in the glaze? It’s not listed in the ingredients. I just updated the recipe. 1/4 teaspoon and it’s optional. Enjoy! These are anything but difficult to make and are SOO good–my most loved mix! These were VERY good, from simple pantry ingredients ! Your recipe was the best! Yum! Can’t wait to try these! Have you ever doubled the recipe? I’m thinking I’d need to use a 9×13? Thanks. Haven’t tried to double this one but you’d probably be fine in a 9×13 pan. Thanks again for your quick reply….and another amazing recipe! I doubled the recipe and used the 9×13 pan, and they came out perfectly. I had several people tell me these were the best dessert they’ve ever had. :) Thanks! Such a big compliment for people to say these were the best dessert they’ve ever had! Thanks for sharing and glad it was a hit! Hi Averie, Would I use the same amount of an actual vanilla bean as vanilla bean paste?? It’s a little tricky because there are many variables, but I would say no; but if in doubt I would add more rather than less than you think you need to. Enjoy!